Madelyn Lugo, born in Yauco, Puerto Rico, was elected as Chairperson of the Board of Directors of the National Puerto Rican Day Parade Inc. in 2006. Previously she served twelve years as Treasurer to the Board elected in 1994. Ms. Lugo is among the co-founders of the National Puerto Rican Day Parade Inc. and has contributed to the growth of the organization for over twenty years. Ms. Lugo also serves on the advisory board of the Center for Puerto Rican Studies (CENTRO) at Hunter College of the City University of New York. She earned a B.A. 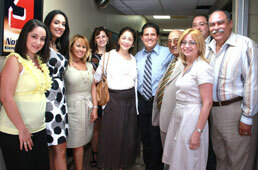 in Business Administration with a concentration in Accounting from the Catholic University of Puerto Rico. Ms. Lugo is the Controller for South Bronx Community Management Company Inc., established in October 1973. She handles property management and real estate development of low-income housing in the South Bronx, solely, or in conjunction with other organizational entities, or through the assistance of governmental organizations. The populations include, but are not limited to, homeless, formerly homeless, and low- and moderate-income families. Melissa R. Quesada-Carino was elected as the Vice-Chairperson to the Board of Directors of the National Puerto Rican Day Parade Inc. in 2006. She was re-elected to the Board in 2010. Melissa Quesada is an licensed attorney in the State of New York. Ms. Quesada focuses her practice in the areas of Real Estate, Trusts Estates, and Civil Litigation. During her career she has worked with various notable New York City firms and agencies; and has worked on cases at both state and federal levels. Her offices are located in New York City and Westchester County. She received her Juris Doctorate from Hofstra University School of Law, and her undergraduate degree from Binghamton University. As a result of her involvement in the Hispanic community Melissa was named as one of MillerCoors 2009 Lideres and was featured in a national print and Internet campaign. Melissa is also a former Local, National and International beauty queen having held the titles of Miss New York, Miss Latina United States, and Miss Latin America World. Melissa's involvement with the parade started in 1998 when she was named Miss Puerto Rico: queen of the parade. Since then she has actively been involved in various roles with the National Puerto Rican Day Parade, Inc.
Trinity A. Padilla, was elected as Executive Secretary to the Board of Directors of the National Puerto Rican Day Parade Inc. in 2006 she was re-elected in 2010. Over the past 5 years, Trinity has chaired a multitude of parade events, most notably the 2006/2007 Heritage Awards and the 2008/2009 Miss Puerto Rico-NPRP Cultural Competitions. She attained a Master of Business Administration (MBA) in Finance and International Business from Pace University in 2006. Mrs. Padilla is a Senior Financial Analyst at PepsiCo, Inc. and has enjoyed building a strong background and career path at a world leader in convenient snacks, foods and beverages. Shirley Cox, was elected to the Board of Directors of the National Puerto Rican Day Parade Inc. in 2006; she was re-elected and assumed the position of Treasurer in 2010. Ms. Cox earned a B.A. in Business from Iona College. In her spare time, she also enjoys her activities as an event planner. She was born and raised in New York City. Her parents were from the towns of Arecibo and Ponce. Ms. Cox is a Director at Healthfirst, the largest hospital-owned Health Maintenance Organization (HMO) in the United States. She has been a key player in enhancing the success of Healthfirst as the leading healthcare plan in New York State. Luis Rivera, born in Mayaguez, Puerto Rico, was elected as General Coordinator of the Board of Directors of the National Puerto Rican Day Parade Inc. in 2002. He attended the Inter-American University of San German, Puerto Rico and earned a B.A. in Psychology. Mr. Rivera is a retired social worker from Lincoln Hospital, affiliate of the Health and Hospital Corporation. 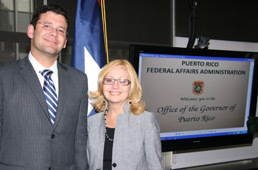 Mr. Rivera has a longstanding career working in the Mental Health industry in New York and Puerto Rico. 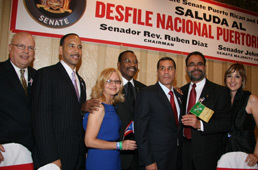 Rafael E. Dominguez was elected to the Board of Directors of the National Puerto Rican Day Parade Inc. in 2006. 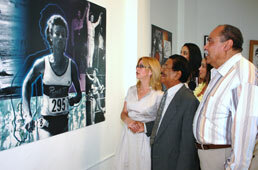 He was re-elected to the Board as the Director of External Affairs in 2010. 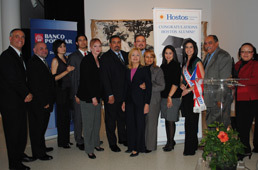 In 2007, he served as the Latino Policy Advisor to New York State African-Americans in Public Affairs Committee Inc. From 2005-2006, Mr. Dominguez served as Director of Economic Development to the Board of Directors of the U.S. African Chamber of Commerce Inc. In 1998, he received a two-year appointment to the Student Affairs Committee of the Board of Trustees at the City University of New York. Mr. Dominguez earned a B.A. in Financial Economics at the City College of New York. Subsequently, he attained a certification in Immigration Law Studies from the CUNY Graduate Center and is completing a M.S. in Urban Affairs at Queens College. Currently, Mr. Dominguez is a Principal at The Word Public Relations LLC specializing in creative management, integrated marketing solutions, and social media environments. He served as the New York Regional Partnership Coordinator at the United States Census Bureau which is responsible for developing and implementing the 2010 Census strategic outreach efforts in Manhattan, Bronx, Queens, Westchester, and Long Island. He was among the first coordinators in the nation to introduce the benefits of social media strategies to promote census participation. Mr. Dominguez was born in Brooklyn, New York and is of French and Puerto Rican descent with family roots in Mayaguez and Santurce. Rosalinda Ortega was appointed as an Honorary Member of the Board of Directors of the National Puerto Rican Day Parade, Inc. in 2010. For over 35 years, she volunteered in the organization and served as the Secretary of Dr. Ramón S. Vélez, Founder of the National Puerto Rican Day Parade, Inc. and President of Hunts Point Multi-Service Center. María Román Dumén, born in Arecibo, Puerto Rico and raised in New York. She became actively involved in community service at a very young age. Ms. Román Dumén is a product of New York’s public school system. She is a graduate of the Dra. Maria Cadilla de Martinez High School in Arecibo, Puerto Rico and received her higher education at the University of Puerto Rico, Mercy College, and lastly at Lincoln University, where she completed courses towards her Master’s Degree in Human Services. In 1974, she joined the Board of Directors of the New York Puerto Rican Parade where she learned to appreciate her role in society. As part of her commitment to her Puerto Rican ancestry, she also accepted numerous official positions within the organization. In 1995, she became one of the proud founding members of the National Puerto Rican Day Parade, Inc. and in October 18, 2000, she was unanimously elected as Chairperson of the Board of Directors, becoming the first woman to preside over the largest national cultural outdoor event in the United States. She currently serves as honorary member to the Board of Directors of the National Puerto Rican Day Parade, Inc.
After close to four decades in state government, Ms. Román Dumén officially retired as an employee with the State of New York in January 2010; but decided to continue her community and public service by participating in efforts to promote and preserve her Puerto Rican heritage. Carlos Velasquez is the President of GALOS Corporation, a leading multi-marketing agency established in 1980. He heads the official marketing agency responsible for all corporate participation in the National Puerto Rican Day Parade Inc.
For forty three years, he has served the National Puerto Rican Day Parade and the former New York Puerto Rican Day Parade in numerous roles from Board Member to Advisor and now the parade’s connection to the private sector. Mr. Velasquez began as an educator and administrator with the City University of New York. He has taught in the State of Connecticut and CUNY - Hunter College. He holds a PhD from Cambridge International University, a certificate in Marketing from Harvard University, a M.A. in Supervision & Research from New York University and a B.S. in Education from The City University of New York. Javier A. Solano born and raised in the Bronx to Puerto Rican parents and is fluent in Spanish. Since 2006, he has served as legal counsel to the Board of Directors of the National Puerto Rican Day Parade. Mr. Solano is committed to providing first-class counsel in both criminal and civil cases. His approach is simple: every client receives the same professional, aggressive and zealous representation possible. His practice, founded in 2004, focuses primarily on serious criminal cases and catastrophic civil cases, in both the state and federal courts of New York. Javier began his career in the Kings County District Attorney’s Office in 1996, where he quickly distinguished himself as a tough, but fair, prosecutor. As a result of his success he was quickly promoted to Senior Trial Attorney in the elite Homicide Bureau, being the youngest prosecutor at the time to achieve that position. He regularly appears on television programs such as “Court TV,” Fox News and ESPN, providing legal and practical insight on current events in the news. Elizabeth Virella, born in San Juan, Puerto Rico, was appointed to the Board of Directors of the National Puerto Rican Day Parade Inc. in 2010. In 1997, Ms. Virella served as the coordinator of the NPRDP - One Thousand Children’s Project, a scholarship program dedicated to promoting and supporting educational opportunities for Puerto Rican youth. Subsequently, in 2000, she served as the Manager of the National Puerto Rican Day Parade Headquarters until retiring after ten years. She was responsible for the daily operations and served as the liaison between hometown organizations of Puerto Rico, parade committees and the NPRDP Board of Directors. For thirteen years, she worked as the Coordinator and Program Director of ATREVETE Inc., San Juan-based non-profit organization, , located in Luis Llorens Torres Housing, the largest low-income public housing project of Puerto Rico and the Caribbean. She earned her degrees in Secretarial Science from Sacred Heart University in San Juan, Puerto Rico and Forensic Psychology from John Jay College of Criminal Justice, CUNY.